The light blue material is 2.2oz HEX70XL ripstop from Ripstop By The Roll (actual weight 2.73oz/sq. yd.). This material has a somewhat heavier coating than most similar material, which gives it a slightly rubbery feel and also makes it harder to pin. I don't think I'd use it again. The hipbelt and shoulder straps are 1/2" closed cell foam and the inside surfaces are a soft shell fabric. The lumbar pad is a sandwich of 3/8" open cell foam, 3/8" closed cell foam, and .032" fiberglass (thin PC board material without the copper.) The fiberglass distributes the weight, as the bottom of the stays are directly behind the lumbar pad. The stays are 0.1"x0.5" 7075-T6 aluminum. The regular aluminum from the hardware store bends too easily in the half inch width. The 7075 is springy and will flex quite a bit without bending. Harder to bend into shape, though. There's a zippered pocket above the mesh panel on the front that's about 8" deep and runs the whole width of the pack. The pocketitself is internal, just the pack material folded over itself. The lid pocket is 11.5"x8"x3" and will extend upward to accommodate the 8" silnylon extension collar (not shown in picture). The lid pocket only weighs 1.6oz., so I decided it was worth it. Overall dimensions are 11.5" wide, 8" deep, and 23" tall, from the bottom to the top of the stays. These are rectangular dimensions, so when actually loaded, it bulges out slightly. I think the main pack is about 2500 cu. in. or 40 liters, not counting the extension collar. Really nice job Bill. Well thought out and excellent workmanship. I think the flat stays will be more comfortable than are the round ones I’ve used. Good job!! Looks really nice! Impressive build and features for the weight for sure. Looks good! 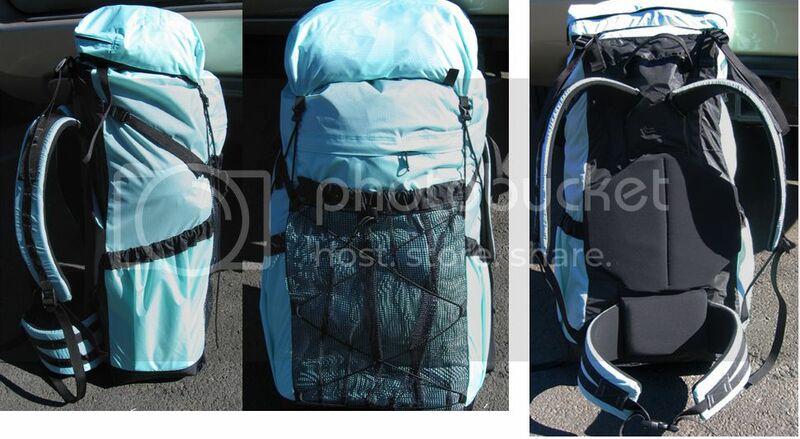 I would want side pockets (for water bottle, tent, fishing rod), but that's me, not you! The trick with these lightweight materials is to handle the pack carefully, not plop it down any old place and especially not drag it. Also, if you regularly smash off-trail through slide alder, devil's club, and similar Cascades vegetation, the material may snag and rip. My pack from Six Moon Designs (discontinued in 2006, so no relation to their current offerings) has held up well in the 12 years I've had it (although I haven't been able to use it much the past 3 years). It's made of silnylon with a dyneema bottom. (It did require a little re-stitching after its first year, but SMD did that for free). It has flat aluminum stays very similar to yours, and, for me, is very supportive and comfortable. I hope you have many good years with your new pack! Thanks. The pictures you sent were a big help. I almost used the aluminum rod but the 1/10" flat stays are a little lighter and I like the idea of the stays connecting more directly to the lumbar pad and the load lifter straps. Thank you. I was pretty pleased with the weight. There are side water bottle pockets. They just don't have anything in them, so they look kind of flat. They're plenty big for water bottles, though. You can see the casing for the elastic in the side view. I made them of the same blue material. Lighter than mesh...we'll see how they hold up. I did make openings in the corners for water to drain out. I suppose the diagonal compression straps above them could be used to hold something long like a fishing rod or tent poles. Awesome! Feels great to get that first one under your belt, doesn't it? Made my first one a couple years ago, took it on a bp trip down the Grand Canyon. I was impressed by how well it handled, then found changes I wanted, which led to my second version. Been using that one for a couple years now, but have to admit I am thinking of more changes for a third version. I love your color choices, and the finished pack looks real professional (mine definitely looks homemade). I would be interested in more on how you added a zipper. I had thought of that a couple times, but wasn't sure how to add a zipper. The ones I've found were of a size that didn't work with my pack. Sorry, I should have taken a closer look! As I mentioned, though, pack features depend on individual circumstances--what works for me may not work for you--and vice versa. It's YMMV and HYOH, again! Please keep us informed about how the pack is working out for you! It looks to me as though you're onto a good thing!--perhaps the start of another cottage industry in our area? Thanks for the kind words. Actually, I've made half a dozen over the years, but not for quite a while. Mostly I've used the same basic design, but with somewhat heavier materials. 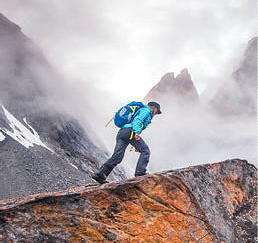 There's a link in the MYOG post with the title, "need suggestions for pack" if you want to see one. For the zippers (both for lid pocket and on front panel) I used #5 YKK continuous zipper. I just sewed across the ends rather than using zipper stops. I made the big pocket on the front by starting with the main front panel extra long (maybe 18" or so). I folded it toward the inside of the pack, then back up, making a pocket about 8" deep. Then made another fold above the pocket opening, this time outward-and-back to form the zipper flap, then the material continues on up to the drawstring. So it's all one piece, with one side of the zipper sewn to the first fold, and the other side sewn behind the zipper flap, making sure not to sew it too close, or the flap will constrict the zipper. I hope that gives you the general idea. As far as zipper installation itself, I imagine there are a ton of YouTube videos on the subject. There's useful tips on thru-hiker.com and also therainshed.com. #5 is about the right size for pack pockets, sleeping bags, and the like. #3 is very light, and works for ultralight clothing and netting zippers on ultralight tents. #8 is for heavy duty stuff, like duffelbags, and #10 is heavier yet. Be aware that there have also been #4.5 and #7 and maybe others. It's a good idea to get the pulls from the same source at the same time as you get the zipper. Also, there are locking and non-locking pulls. The locking ones require a "downward" pull to unzip. Best to avoid for backpacks.